With the huge sum of money spent on rural school electrification, it is hoped that we can close the digital gap between urban and rural students. It should. But of course the main issue is the educational aspects of the rural areas. 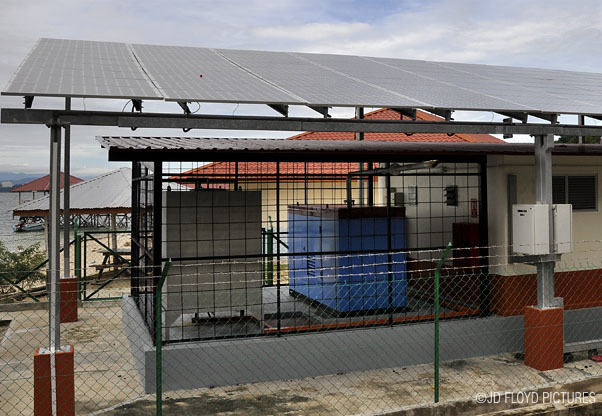 Malaysian Deputy Education Minister Dr Mohd Puad Zakarshi told newsmen recently that the government has allocated RM700 million (US$223 mil) for the implementation of the hybrid solar supply system for 179 rural schools in Sabah that have yet to receive electricity supply. Out of the total, RM300 million had already been spent for the first phase involving 78 schools which had been fully completed. Another RM400 million was for the implementation of the second phase of the hybrid solar project involving 101 schools. More hybrid systems are needed? The 179 rural schools were selected from an initial total of 270 schools in Sabah that do not have electricity from the power grid - as at 2010. With SESB's target of 95% power supply coverage in 2012, this number should have been significantly reduced. My personal opinion is that, in a long run, grid connected power is the way to go as the maintenance of the stand-alone solar system components is very much higher than the grid connected system. A study on two of Sabah's rural school hybrid solar power units showed that batteries contributes about 45% of the lifetime cost. Spending millions of Ringgit for rural schools electrification is indeed a noble idea. It opens up a lot of opportunity to the rural students as well as benefiting the community around the school. It close the gap on the availability of online information, as well as getting rid of the limitation to carry out school (and social) activities only during daytime. The community - and this must start from the affected schools - must be taught to take care of the facilities. This does not necessarily means they must be able to troubleshoot or repair faulty components but they could start with relaying the information to the agency responsible for maintaining the system. At the same time they can learn to clean the solar panels and to take important readings from a user-friendly monitors and/or indicators. Dude, where do you find all this information?? Hahaa. Very informative. And this post is a good one. Feel glad for the children that receive this electricity for their schools. @Armstrong - some thru experience, some thru official channel & some thru unofficial means. Feel happy for the kids too. Inteesting and informative entry here. It is good that kids of the interior get to share a little of the modern amenities that their brothers in urban experienced unlike in the olden days. bagus juga idea guna solar di pedalaman. kalau nak tunggu elektrik masuk tak tau bila pulak kan? solar is very popular here in the states now..
@tehr, Angie, gadisBunga - Thanks for visiting. The kids do not have to go through the difficulties we went through, right. @Annmarie Pipa - I read that your Government is rushing now for the Anti-dumping policy to ward off solar panels from China. Hope Malaysia's won't be affected as we produce better quality and put the environment factors into the manufacturing process. The key components of off-grid solar power system is the battery. * Not envirnomental friendly:it is having lead & emit hazardous gases such as hydrogen or sulphuric acid fumes. * Bulky: causes high logistic/ transportation cost. * Low charging efficiency: causes high solar panel sizing is needed. * Low discharging efficiency: causes high Lead Acid battery sizing is needed. @yk_koh. If my reference is right, the rural schools in Sabah are using tubular vented lead acid battery bank for energy storage (deep cycle). What battery type do you think they should be using? @Abdul Muhaimin Mahmud - great insight from a person such as yourself, who actually went to the site and analyse the data, performance & viability of the project. I wanted to put the link to your research but sometimes links become void and Google penalise this site for bad links. Great article and great efforts ! Wonderful ! Would it be possible to still share your research please? 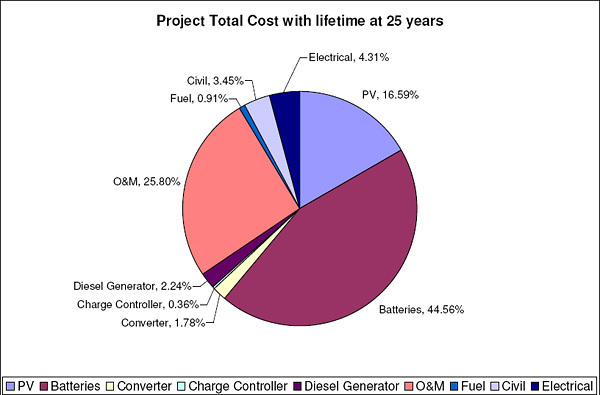 I think it is very interesting to have a read on the cost breakdown of the system because I am currently thinking of setting one up for my factory. This is very useful information. Glad that I found this website. Thks admin.